The above link is to a short video clip of false prophet and heretic Mike Bickle answering the question of whether a prophet today should be disciplined in some manner if what they prophesy fails to come to pass. One should expect a ridiculous answer from someone who has prophesied incorrectly in the past and is associated with nearly every false prophet in operation today. The Kansas City prophets, which Bickle is also affiliated with, have stated that a 65% successful prophecy rate makes you a pretty good prophet. How absurd and unbiblical. Beloved, as we have covered before, prophecy is hearing directly from God. In the Old Testament there was no ready access to the Scriptures for people. There were no printing presses. God's people were also contained to the nation of Israel. These things combined for God to choose people to be His vessels for communicating with His people. Because God is never wrong and does not stutter, the success rate expected for prophets was 100%. God takes it quite seriously when people pretend to speak for Him. If they were found to be false, they were stoned to death. Jennifer Leclaire is a false prophetess on the rise over at Charisma News where she serves as an online editor. She runs a heretical school that pretends to be able to teach people how to be prophets, which usurps the power of the Holy Spirit. For an extra $400 you can also join her band of prophets and be under her "covering." This is big business beloved. Fleecing the flock of God always has been a cash cow. So this "prophecy" was offered up by Jennifer today as a prophetic word for the remaining six months of the year. There are certain hallmarks of the typical false prophecies today that we can see here. First of all they are vague. A vague false prophecy allows the false prophet to claim they were right based upon easy conclusions. The key word is next? Really? There is a next after the next for you? Isn't there always? Secondly there are extra-biblical terms used give a super-spiritual sense to something very carnal. Prepared your heart, sudden shifts, and mega transitions are examples we see in this false prophecy. There is usually something shifting in the atmosphere and new realms or territories to move into. This is the bait that sits upon the hook beloved, trying to lure you in. Thirdly, it is about you and not about God. This one is key because prophecy has been perverted into a blessing predictor by the False Prophet Industrial Complex. Prophecy is no longer about us doing better by God but rather He doing better by us. In the Leclaire example we see a God who wants to move us closer to our dreams, closer to our destiny, and closer to all the people who can help us make the connections we apparently need in order to succeed at what God has called us to do. What utter nonsense. I might add this is also a "prophetic onesie." That means we are to believe that everyone who is a believer in God will be experiencing a "mega transition" in the next six months? All of us? In every country? Unless Jennifer means only those who read the prophecy on her website. But that would make for quite a capricious God. So the Lord has a Word of mega transition but only for the portion of the body of Christ that happen to checkout Charisma News that day? Prophecy does not work like this beloved nor is it overly focused on you at the expense of God. Nonetheless Mike Bickle answered the question at hand in such a flippant, casual manner as to indicate how he approaches the serious business of speaking on behalf of the Lord. This was a short clip but there are several points to reason together over and see how a false prophet's mind truly operates. Point Number One -- the prophecy was not false, it was just wrong. Yes you heard him right. Bickle realizes that false prophet sounds really really bad so he tries to redefine what we are talking about. He admits that a false prophecy sounds demonic because it is and because he does not want to be associated with that he tries to pretend that intent is more important than accuracy. That sincerity is more important than whether the person actually heard from the Lord. In his own words here, "he is not false, he just missed it." Just missed it? What does that even mean? You either are hearing from the Lord or you are not. There is no third choice. A few years ago, Harold Camping told everyone the day the world was going to end. People sold their properties and indulged through their savings because they believed it was a word from the Lord. Then the world carried on beloved and do you want to explain to someone who lost everything that Camping's intentions were benign? Who cares? If you want to see something truly sad go check out a thread on Facebook for someone like Joel Osteen. He will post something extremely sugary and overly positive and get thousands of doting fans worshiping him and his little ear scratching nugget of unbiblical carnality. In the midst of the praise however you will be bound to see someone comment that even though they are doing all of the positive, word-faith, NAR stuff they are still diagnosed to die. Or still facing foreclosure. Or bankruptcy. Do not think for a second there are no victims of false prophecies. I have heard from people and know some personally that will never go back to church because of a false prophecy or false teaching. When you preach the false belief that God has to heal you for example and your spouse still dies what affect do you think that has on the person? Chances are they will either blame God or blame their own "lack of faith." When you prophesy a mega movement for everyone and it only happens for let's say 20% of them, what do the remaining 80% think about God? 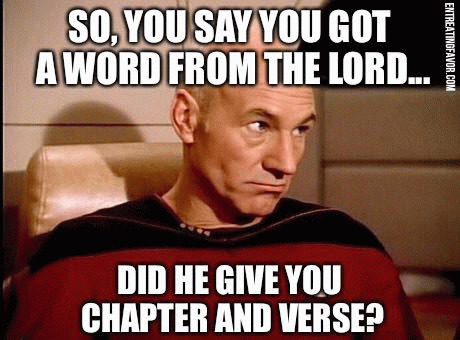 After all you claimed the word came from God! Bickle tries to change the language here because the correct language convicts him. He is not merely wrong beloved, he is false. Point Number Two -- prophecy and prophets are somehow different in the New Testament from the Old Testament. This is the belief held by everyone of the false prophet brigade today. They have to hold this belief or else they know that one wrong prophecy disqualifies them. Bickle tried to make this assertion sound Biblical but it is not. There is absolutely zero biblical evidence that God changed prophecy between the two Testaments. Essentially it is the same thing beloved -- someone claiming to hear from God. In the Old Testament, people heard from God audibly, as Bickle correctly points out. He then jumps the rails however by claiming that New Testament prophets prophesy through faith by the means of "impressions." Two major points here. The first is that it is true that the Bible says to prophesy according to your faith but that does not mean anything different from the Old Testament prophets. What is it that we are to have faith in beloved? God and His word. In the Old Testament, that faith may have come easier because they audibly heard it but our faith in the Bible today should be just as strong. The more we know the word and the more we believe in it the greater our faith will be and thus declaring it will be proportional. Secondly, "impressions" is found nowhere in Scripture. Prophets are not meant to prophesy based upon their impressions. What they feel or believe they are feeling. That is how you "get it wrong" because the heart is wickedly deceitful above all things. So when you are trying to evaluate your impressions and you think God always gives you fresh revelation it is no wonder we end up where we are today. I watched a teaching once from Bethel Church for their worship leaders trying to teach them the unbiblical concept of prophetic worship. The teacher said that during worship the leader should just "feel for God" and listen for the still small voice and then whatever popped into their head must be from the Lord! To prophesy it out as part of the music! Are you kidding me?? Whatever popped into your head was from your wickedly deceitful heart, not God. I had the displeasure of watching this practice live once. The worship leader claimed God was showing her a river with Jesus standing in it and she sang for twenty straight minutes -- "Jump in the river if you want a hug from Jesus." What a train wreck.